I spent the last days of September 2011 becoming a celebrity. Yep. 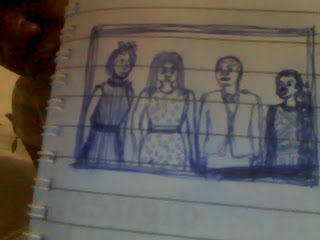 Photo: World-famous Genevieve, "Jenifa" Funke Akindele, the guy is Debola (Chude's "brother"), and that's me on the right. I'm short because I ditched the high-heels under the table. Dem wan kill person. My kids in this small town probably don't believe that I hung out with Jenifa, so I'll have to show them the real photo: my claim to fame. But they never heard of Genevieve, the poor darlings. I'm not showing you the hilarious photos of me in wifebeaters at some Veuve Cliquot champagne gig. (Seriously, who dresses all nice on a Thursday morning?) But I will tell you that my blog brother, Uncle Erik is publishing a recent chat we had - yay! P.S. I'm in a quiet town at a writer's residency. Drew the sketch from memory - it's burned in my brain after the many minutes I spent waiting for it to open. P.P.S. Speaking of the fame-monster, I know this Attila astrophysicist guy. But you don't believe me! Jumped over from Eric's blog just to say it sounds as if you have found your way well and with courage and with every move left a bit of the normal bit of fear behind. It was a great interview. I never knew the walking man was named Mark. Thank you. It's truly kind of you to write something. Thanks. "Our doubts are traitors..."